Week Four of my Make-Ahead Mondays series bring a simple four-ingredient entrée: Cranberry Chicken! Stir the dressing, cranberry sauce and onion soup packet. 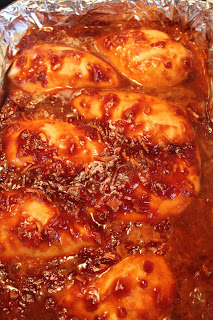 Lay the chicken breasts in an 11x13” pan. Spread the sauce over the chicken breasts. Bake at 375 degrees for about 40 minutes or until a meat thermometer reads 160 degrees. 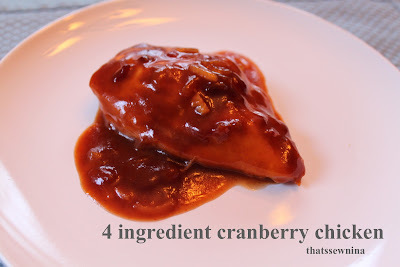 I’ve tried a couple of variations on the cranberry sauce and also really like using apricot preserves for something sweeter. That’s it! Serve alongside some veggies and/or rice or potatoes. bake for 40ish minutes at 375 and you're done! now you've just gotta figure out what to serve with it.